GoMakeADifference, (GoMakeADifference), has this year been expanded to all UWC schools and colleges – with 20 grants being awarded of £1,000 each for UWC students to go, make a difference immediately after they graduate. 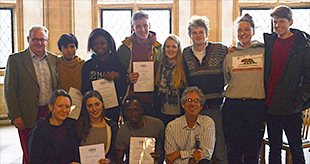 UWC students will be delivering community projects in eighteen countries across Europe, Asia, Africa and the Americas. They have designed and developed each of the project themselves, based on a wide variety of global challenges and contexts. The founders, Colin Habgood and Jill Longson, were impressed and moved by the diversity and quality of projects and the obvious commitment from applications. Setting up a new data management system for a health clinic to provide better reporting and analysis of disease rates in Timor Leste. Improving water supplies in two areas of Tajikstan and Sierra Leone. Delivering de-stigmatisation programmes in Sierra Leone and Swaziland related to Ebola orphans and HIV. Distributing menstruation cups in Kenya to adolescent girls, to increase school attendance. 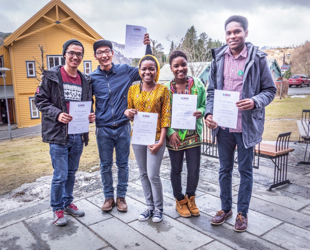 Increasing awareness of social issues in Greenland and Brazil. Helping resolve high infant mortality levels in Burkina Faso with a practical twelve-month programme. Implementing recycling and clean-up programmes in Zimbabwe and in Venezuela to provide a more sustainable environment. Building and delivering a new tsunami lifeboat in Japan, through an extended design of the Atlantic College rigid inflatable boat and training local fishermen in lifeboat skills. Promoting children’s rights in Peru, helping to reduce the level of child workers in this country. Encouraging young people in Aragon, Spain, to support the education and settlement of young Syrian refugees into the local community. In true UWC spirit, some projects are being delivered by students coming together across more than one school/college. Led by Blessing Chirimbani from UWC RCN, with support from UWC RBC and UWC Mahindra – ‘A voice for the voiceless’ project will refurbish a boys’ home and provide a better education environment in Zimbabwe. GoMakeADifference, GoMakeADifference, was created by Colin Habgood and Jill Longson (AC81 and Vice-Chair of UWC International). It was launched in 2001. It was initially established to provide grants to UWC Atlantic College students to help them live the UWC mission when they left AC. 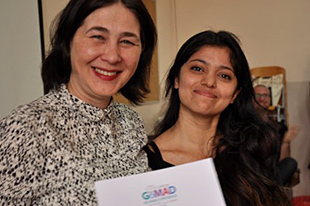 Since then GoMakeADifference has awarded grants to over 50 projects with more than 500 participants in over 40 countries around the world, with thousands of people benefiting in many ways, from UWC students passion and commitment. Talking about this year’s applications Colin commented, “We were delighted with the response from students in the UWC community. There is no doubt this year, the quality and diversity of projects was of the highest level and made deciding very difficult. Projects have been awarded on the originality of the project, the level of impact and sustainability they will have, the level of personal development and challenge for the students and their likelihood for success. Jill and I are confident the projects awarded will make a difference to the communities as well as developing the UWC students to help them live the UWC ideals in future life. Our idea is to use this grant offer as a catalyst for cementing the principle of community service with action. The projects that were not successful in the grant application are all highly worthwhile and we wish all projects the greatest success. We hope they will all be both fulfilling and developmental. We would like to thank everyone who submitted an application this year and hope that somehow they can all still deliver their projects. We would also like to thank the UWC GoMakeADifference Co-ordinators at the various colleges in helping promote the award scheme and with applications. We hope the GoMakeADifference projects awarded this year will inspire students to start to think about how they could make a difference in 2017”. The GoMakeADifference website will be posting updates on the projects awarded this year and will shortly be advertising the process and deadlines for 2017 applications. To view a list of the 2016 Winners, click here.